Joe Bullock will be flying the flag for all part-time Championship players in the World Club Challenge. The 26-year-old prop finished the 2018 season with Barrow but, after just two Super League appearances for Wigan, is set to face Australian champions Sydney Roosters in the biggest club match in rugby league. Championship to Super League with St Helens and Warrington respectively and went on to star for England in the last World Cup. "They're the stories that you look at," Bullock said. "It's easy to forget sometimes that there's a league outside Super League. "So when you see players coming from the Championship and stepping up and being so successful, it gives you the confidence and belief that you can do it as well. "It's a tough way back in sometimes if you don't make it at 19 or 20. You've got to do the graft but hopefully players can see that pathway." Bullock, who comes from Blackpool, is in his second spell with Wigan having played for the club's academy alongside Dom Manfredi and Sam Powell. "It's the opportunity I wanted, to go full-time and be pushed," he said. "I absolutely loved pre-season. "I thought I'd have to wait for my chance but Adrian (Lam) saw something he liked and he gave me an opportunity. "The games are getting bigger and bigger, I'm just ticking them off and, if I get a chance to play this week, it will be amazing." Bullock is firmly in the plans of Wigan's interim head coach Adrian Lam, who has not been surprised by the impact made by the forward. "Obviously when players come into the club, they've been identified and they're the right ones," Lam said. "I guess the surprise part would be that he was a winger. He's a front rower now and he's still really, really raw so the exciting part about Joe Bullock is that in two years' time who knows where he's going to get to? "Wigan have got him long term and he's getting better every week." 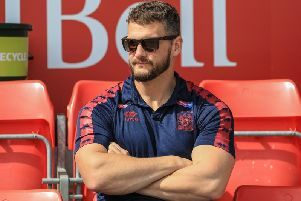 Bullock will be going up against the likes of New Zealand Test prop Jared Waerea-Hargreaves in Sunday's game at the DW Stadium but there is little chance of him being fazed by the occasion. "There's world-class players in Super League as well," he said. "Last week we had the England front row against us. "You don't get into the hype of it. They're a good side and a big club and it would be amazing to play against them but I don't think we need to put them on a pedestal. We can definitely take it to them and beat them."